I have finally completed construction of my version of the Ladies’ Wrap #0291. 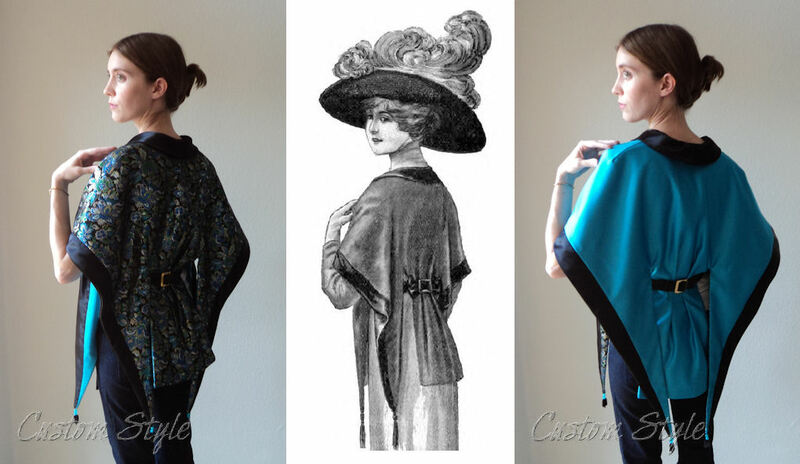 The finished 2-in-1 vintage style wrap – back view. The finished 2-in-1 vintage style wrap – front view. 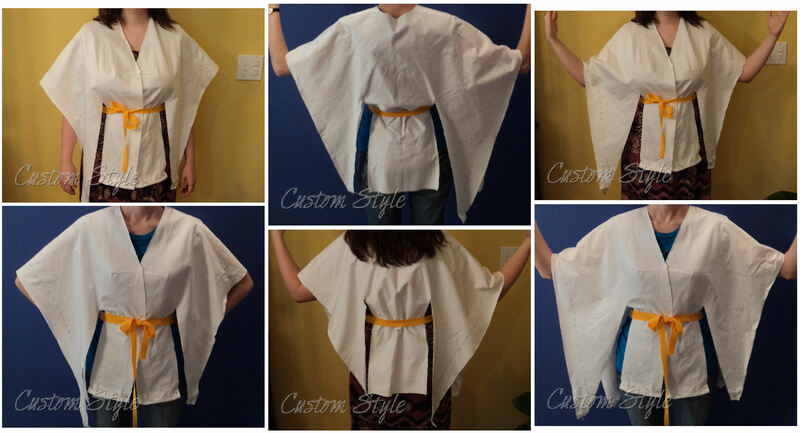 In case someone missed the previous posts about the wrap, I picked fabric and fit the mock-up & altered the pattern. I decided a lined version of the wrap would look better, and because it would be lined, I could easily make it a modern 2-in-1 wrap. 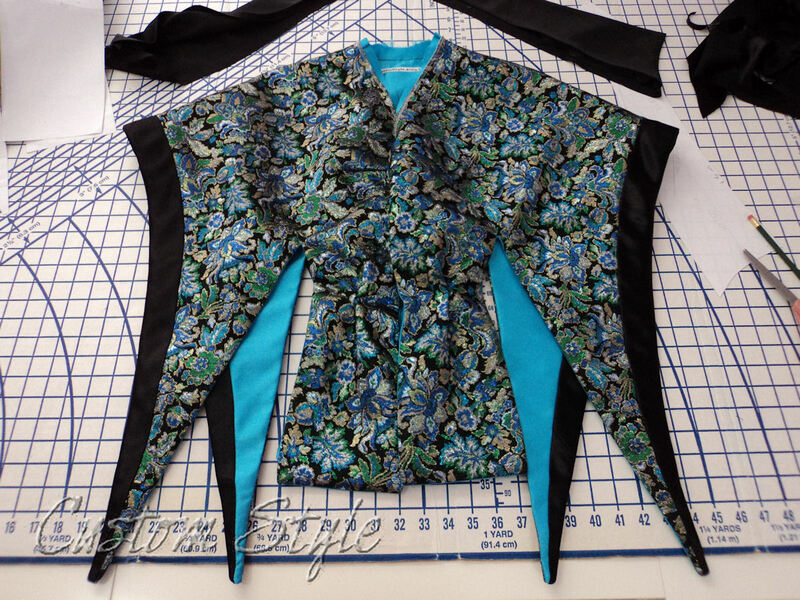 Pattern traced without seam allowance onto the back of the turquoise satin. But, unlike the satin, I determined the metallic brocade shouldn’t be cut on the cross-grain because the woven print of the fabric looked best using the standard selvage to selvage width. 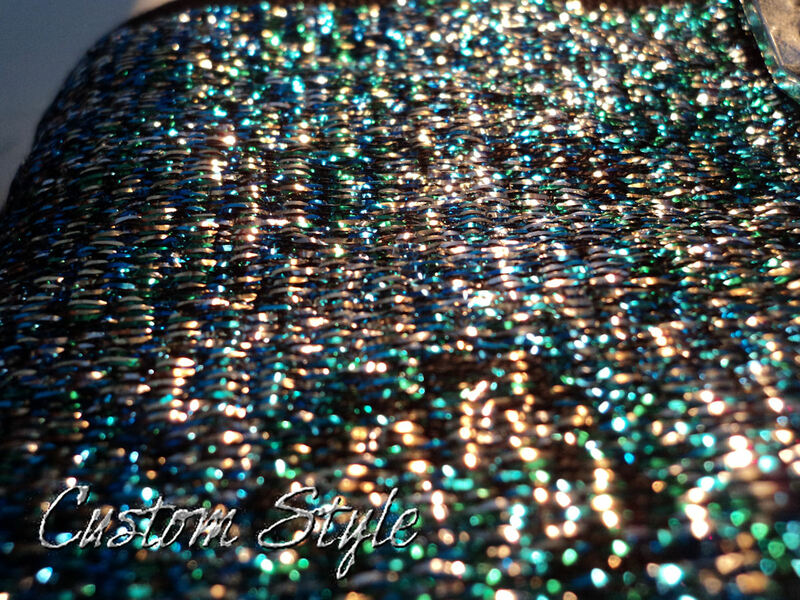 So I decided to sew two panels of the metallic brocade fabric together (matching the woven print) before I cut anything out of it. Because of my fabric choice, the project now got tricky. Most sewists will never have to deal with some of the following issues, but if you ever do, you might find the information useful. The brocade I used is a continuous brocade, meaning there were lots of floating threads on the back, and I knew it would fray like crazy once I cut it. And those floating threads are stupidly shiny metallic beasts (the fabric looks like sequins in person), which made the back side hard to mark. The threads also made it next to impossible to match my print because they prevented me from seeing the flower pattern from the wrong side of the fabric. It is a bit blinding under the machine light! I lined the print up on the right side of the fabric by folding one panel’s selvage edge under and pinning in place. Then I thread-traced (in red) both sides where they would be stitched together. Matched print and thread-traced stitchline. 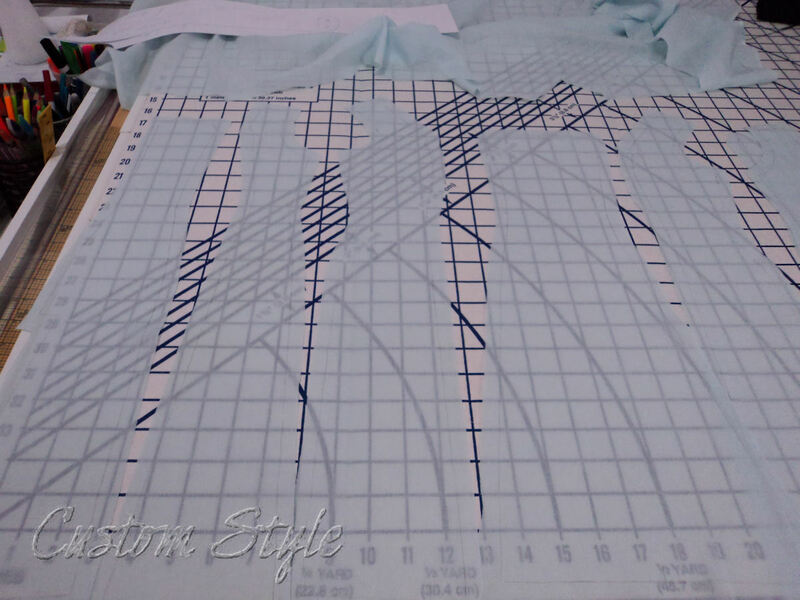 After tracing the stitchline, I repinned the panels directly through the thread-traced lines from the wrong side of the fabric, making it ready to sew together. Notice my selvage edges are uneven because the print didn’t match right at the edges. I stitched the two panels together (shockingly, I only had to redo a small 3-4 inch section to fix an alignment issue), removed the thread-tracing, serged off the extra seam allowance, and ironed my seam allowances open. 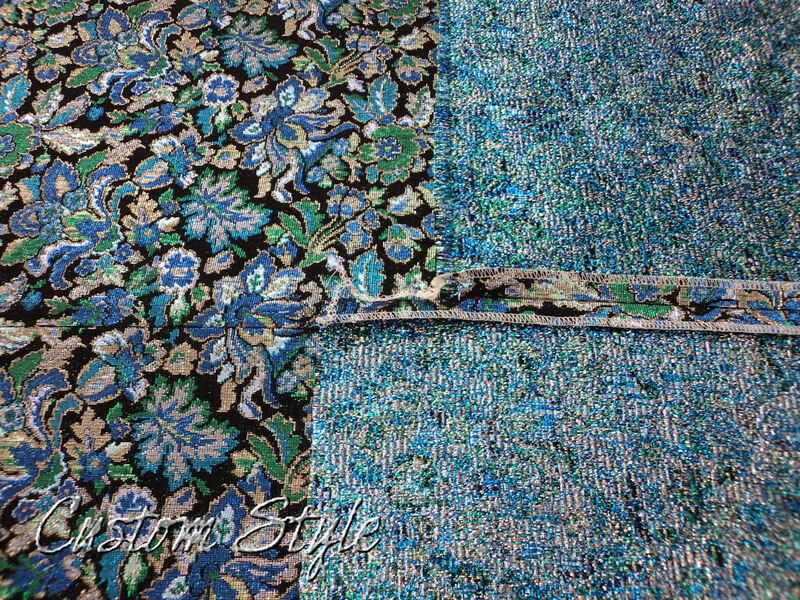 Matched print on right side of the brocade and how the finished seam looks on the wrong side of the fabric. I could easily mark the cotton and actually SEE my marks on the cotton fabric. The cotton fabric would prevent the floating metal threads from snagging and wearing holes in the satin that would ultimately be backed up against it. The cotton fabric would soften the ridge of the center back seam allowance where it would touch the un-seamed center back of the satin. My flat-lined layers of cotton and brocade with pins and hand-basting. It looks like a butterfly! My pattern “notcher” and notched line on the pattern. 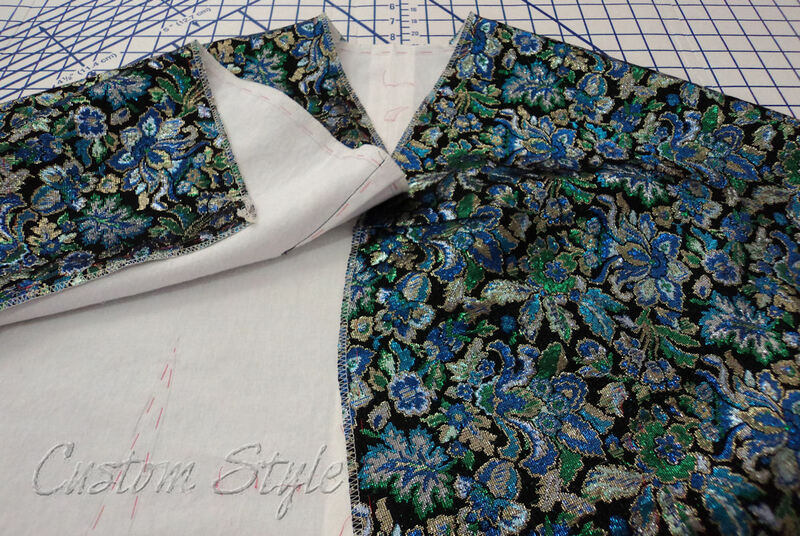 On both the satin and the brocade sides, I marked my trim placement line using the notched dotted line. At last, I was ready to actually cut my fabric! Scissors please! I cut out an unmeasured seam allowance around the traced lines but I did NOT cut into the points separating the sleeves from the body yet. 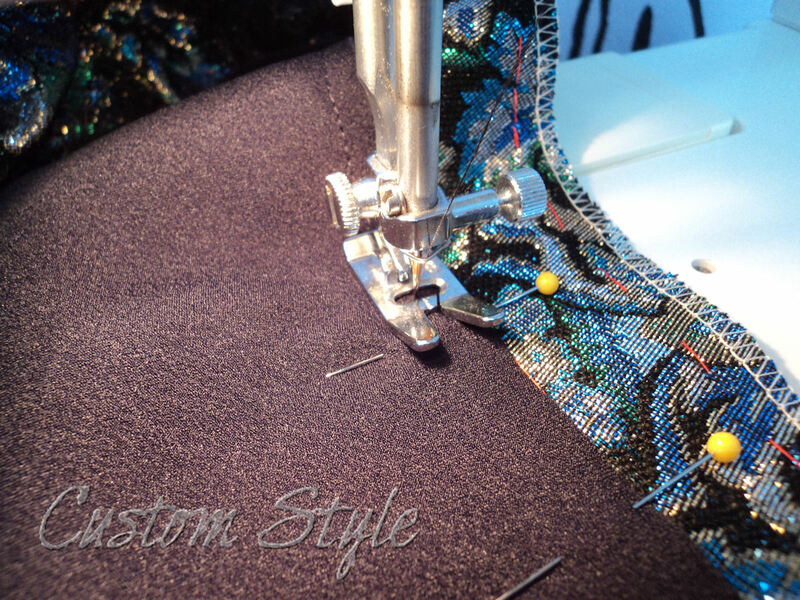 My motto is only cut your fabric when absolutely necessary – especially when it comes to point sewing. Flat-lined brocade cut, but not between sleeves and body. Then I machine stay-stitched the satin half (about an eight of an inch outside the stitchline) and I serged around the cut out brocade/cotton piece to prevent fraying. Sewn darts and serged edge. Trim sewing came next. I cut 4-inch wide bias from some black crepe-back satin, and pinned it (right side down) along the marked lines on each sleeve. 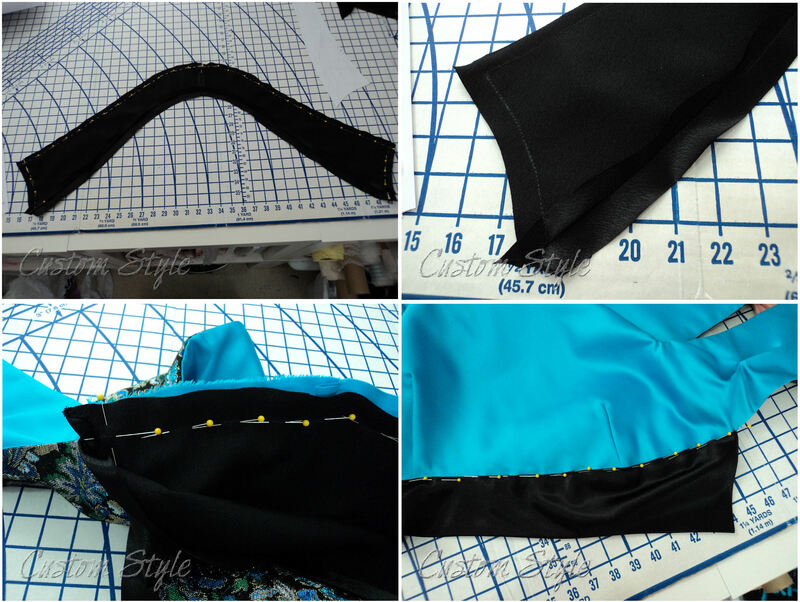 Black bias trim pinned along marked line. I stitched one-quarter inch (presser foot width) in on the edge of the black bias – thus attaching it to the actual “trim placement line” because I marked my line one-quarter inch in. This allowed me to hide my stitchline under the bias (unlike the written instructions for the trim) when I pressed the bias back to the sleeve edge. I machine-basted the bias to the edge of the sleeve and trimmed off the excess. My two versions of the wrap with sleeve trim and the tucks hand-stitched in place (R). Then it was time to join the two wraps! I stitched the two wraps together (matching the marked stitchlines and ignoring the unmeasured seam allowance) leaving it open where the collar would attach. Both sides stitched together and ready to bag out! I made an extra stitchline inside the underarm points because of the fraying nature of the brocade. And then using my sharp scissors, I cut carefully to the point and immediately fray checked the edges around the point. 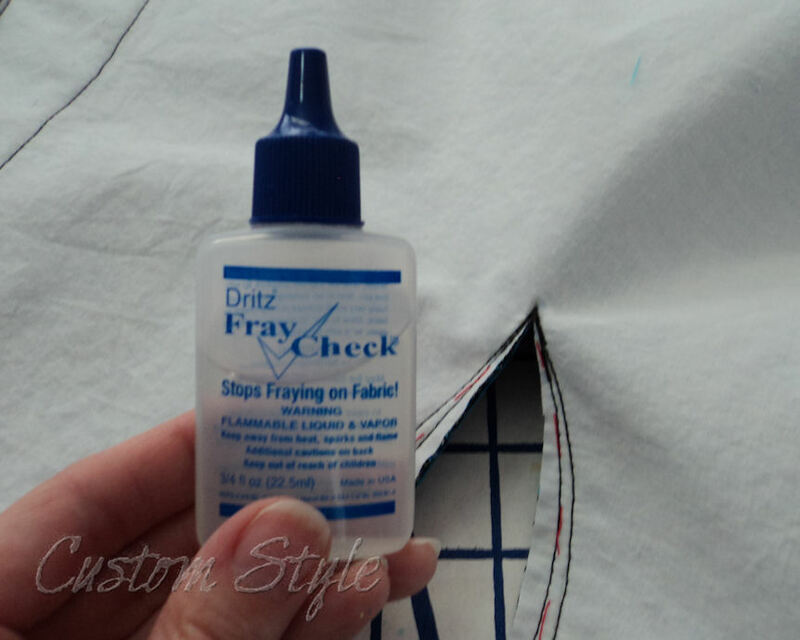 Fray Check – what would I do without it? Once I had turned the wrap right side out, I hand-stitched around the underarm points to secure my crazy brocade and to prevent a stress point later. I just did a little whip-stitch around the point. And the reversible wrap was almost complete! It just needs its collar! Then I made the collar with one side pre-folded in and attached the other side to the wrap, sandwiching the opening (left for turning the wrap right side out) between the collar pieces. I hand-stitched the folded-in side of the collar to close everything up, and then decided to do a nearly invisible pick-stitch along the edge of the collar to control the edge. I also pick-stitched through all the layers of the sleeves (just inside the turned edge of the bias trim) in order to keep the layers from shifting. My hand-sewing along the edges of the collar and sleeves. I made a matching black front-tying belt with a back gold buckle decoration and secured the front overlap with a center front snap. Back buckle detail which matches the original design sketch. I chose not to use tassels on the sleeve points (because tassels always make me think clergy or home décor) and instead, attached a few beads to the four points. 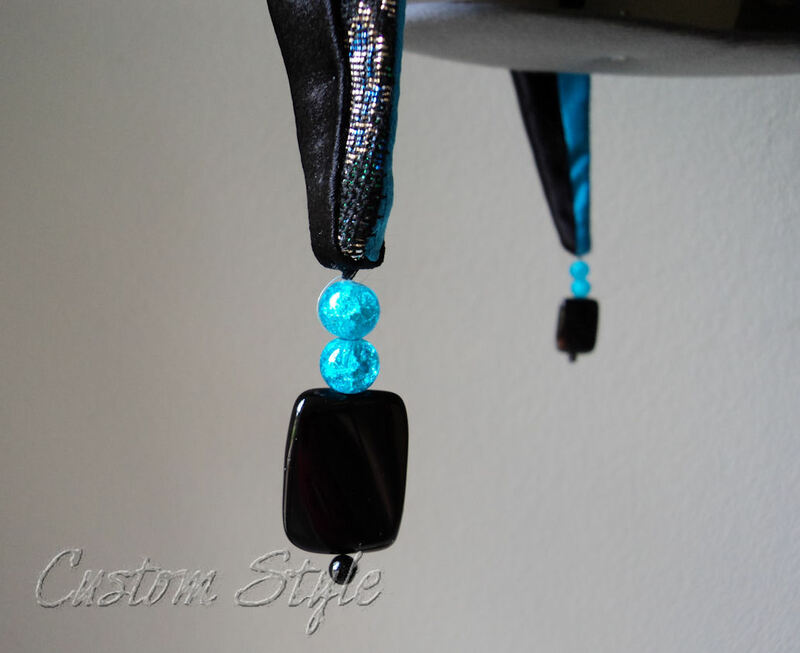 Turquoise cracked glass beads with onyx stone rectangular beads on the sleeve points. I think this pattern is meant for someone who is comfortable working with bias edges – there are so many angles and points for something so visually simple it’s not really beginner level. My fabric choice complicated matters for me during construction, but I made it work. While the fabric I chose makes the wrap rather warm (it would be perfect for cold weather), it could easily be made of a variety of different fabrics. I can’t decide which side I like better on the outside – they are both so different! Floral brocade print side out vs. solid satin side out. I have an irksome tendency when I make something – it has to match the picture I’m working from or I will spend forever and a day tweaking the pattern until it does. Inner Perfectionist: It’s not quite right. Lazy part of me: But it’s only off by an EIGHTH of an inch. Perfectionist: Yes, but it’s off and it will drive me crazy! Lazy: No one else will EVER notice. Perfectionist: True, but now that I’ve seen it, I can’t un-see it. Lazy: FINE. I’ll fix it. So, anyway, you might remember that I chose the Ladies Wrap #0291 for my next assignment for The 1912 Project (honoring the 100th anniversary of the Titanic) because it looked fairly straightforward. However, it turned out to be one of those deceptively complex patterns that poked at the perfectionist in me. The wrap has four darts, and their purpose is beautifully understated. 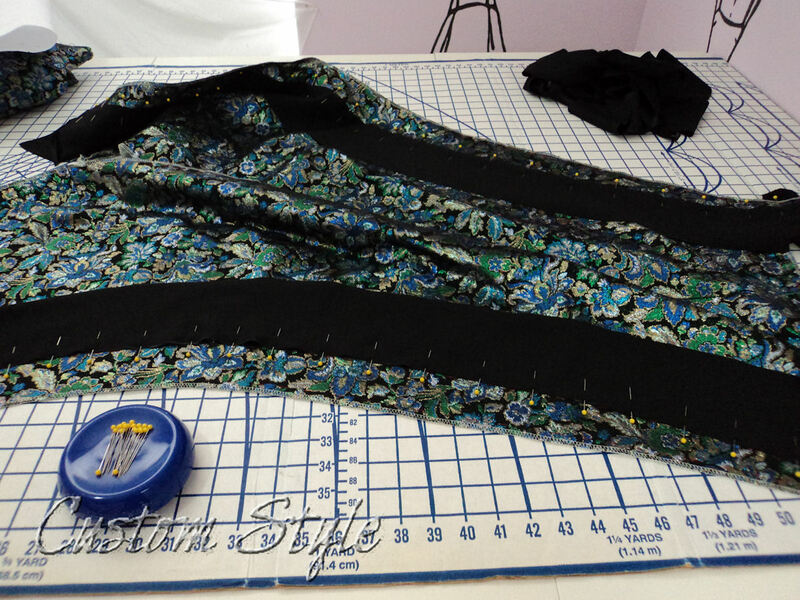 Two are the shoulder seams, and two meet at the center front creating an almost horizontal line from bust point to bust point (but will be hidden by a collar on the finished garment). 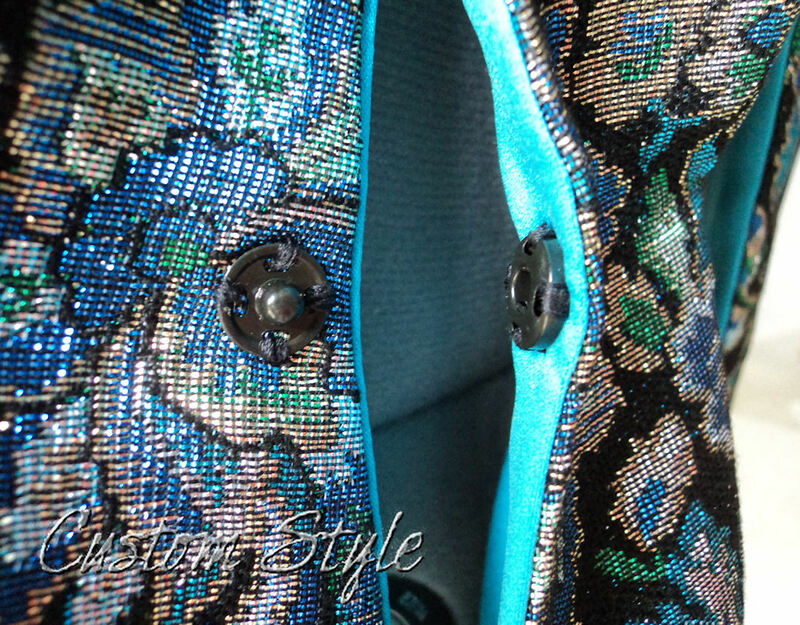 These darts have perfect placement and are the textbook size for the 32-inch bust that the pattern is labeled as being – and because bust point measurement and shoulder seam measurement vary so slightly from size to size, the simple wrap style (a lapped front & open sides) can easily fit bust sizes ranging from 30 to 42. 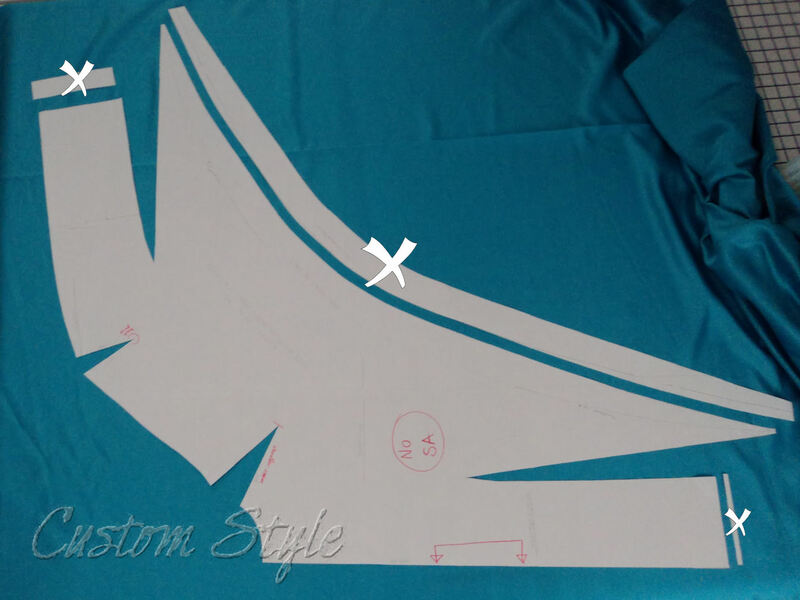 Using a left-over piece of a bed-sheet from another project, I cut out a mock-up without any seam allowances. That meant the edges were right where the hem would be and I could check the overall fit & silhouette. Ack! My arm completely disappears when I put my hand on my hip! I know I’m small but I have long arms – and the sleeves were way long, so it looked like I was wearing someone else’s clothes! The drape of the sleeve couldn’t hang gracefully with the arm raised & bent and didn’t match the design sketch, so of course, it completely BUGGED me. It’s not terrible when I don’t bend my arms (it kind of reminds me of church-pageant angel sleeves) but I would look silly walking around with my arms out all the time! Me wearing the mock-up without any adjustments. The results were quite interesting and confirmed my suspicions: upper arm length is not all that different from size to size, and I was right there at the average middle – 11 inches from shoulder joint to inside elbow. I used a marker to draw new hem lines on the mock-up while trying to more closely match the sketch. For demonstration purposes, I only cut off the left sleeve. You can see my marks in green on the uncut right sleeve. and my sister’s arms are a little shorter than mine! Altered pattern piece with trimmed off scraps (marked with x). For those who want to know specifics, I cut 2 inches from the sleeve length and adjusted the curve slightly to make the points less square (matching the sketch). I trimmed 1-3/8” off the front hem and a scant quarter-inch off the back hem. Now that the pattern is fixed (and my inner Perfectionist can find some other project to obsess about), I’m ready to cut the real fabric and have some fun with construction… exactly 100 years to the day that the Titanic sank. 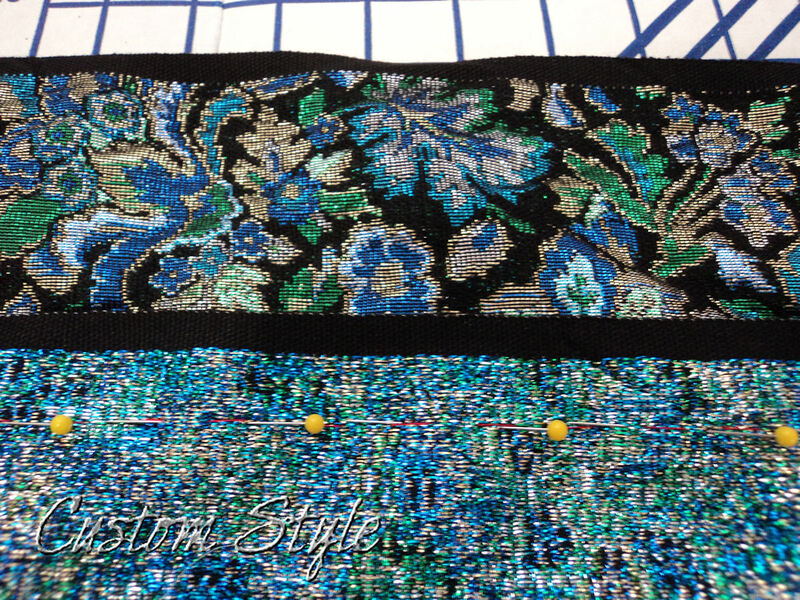 Now see the completed reversible wrap! 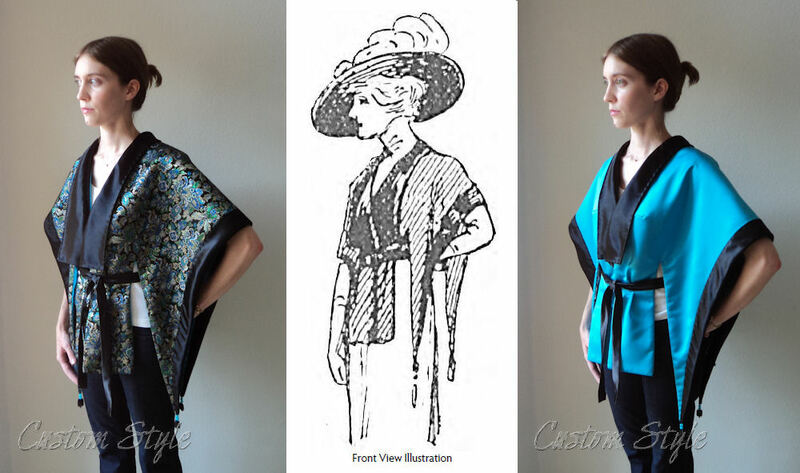 I have officially started my vintage pattern testing for The 1912 Project that I mentioned previously. 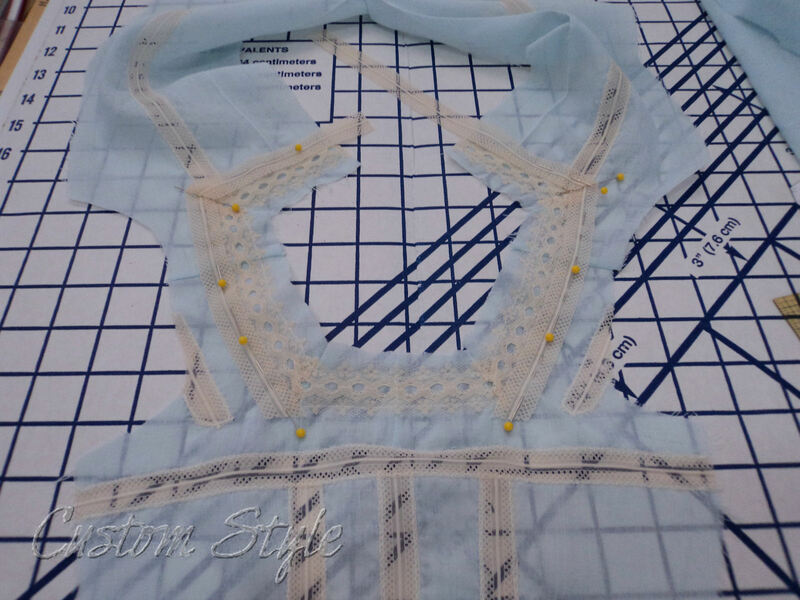 We are only required to make a mock-up of one garment a month, but I told myself that I would make a finished garment of the patterns I like… as long as I don’t have to buy many supplies. I tackled the February Challenge Pattern mainly because I like it but also because I have yet to receive the pattern for my group – I’m in Group 4. 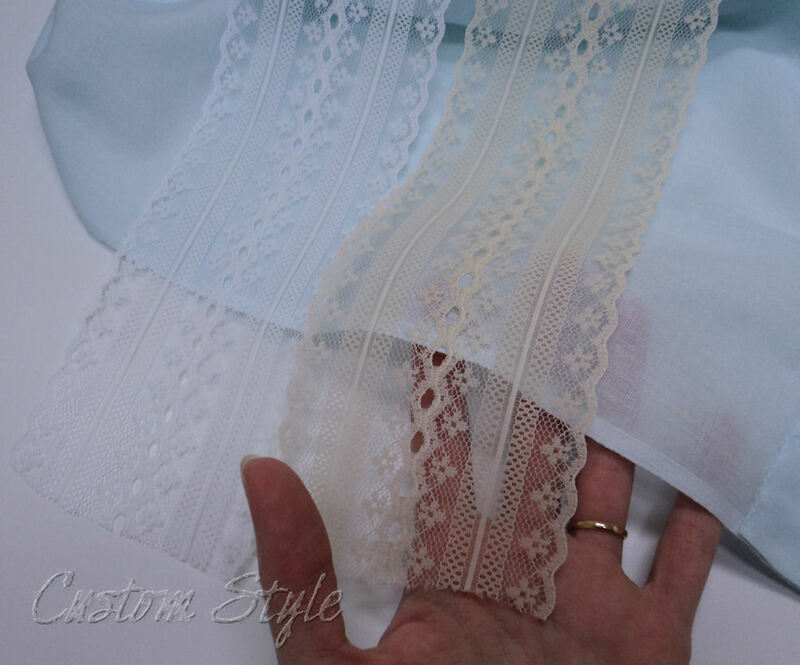 The instruction sheet for the vintage slip with princess seams had a list of 3 types of lace for a total of 16 yards of trim! My color coded pattern key. I went digging through my box of lace. I didn’t really have anything that had the two straight sides that qualifies as insertion lace. However, I did have some pieces of 3½-inch wide lace that was horribly scratchy (good thing no one will ever be wearing this lace!) and would work for all three types of trim I needed – if I cut it apart. 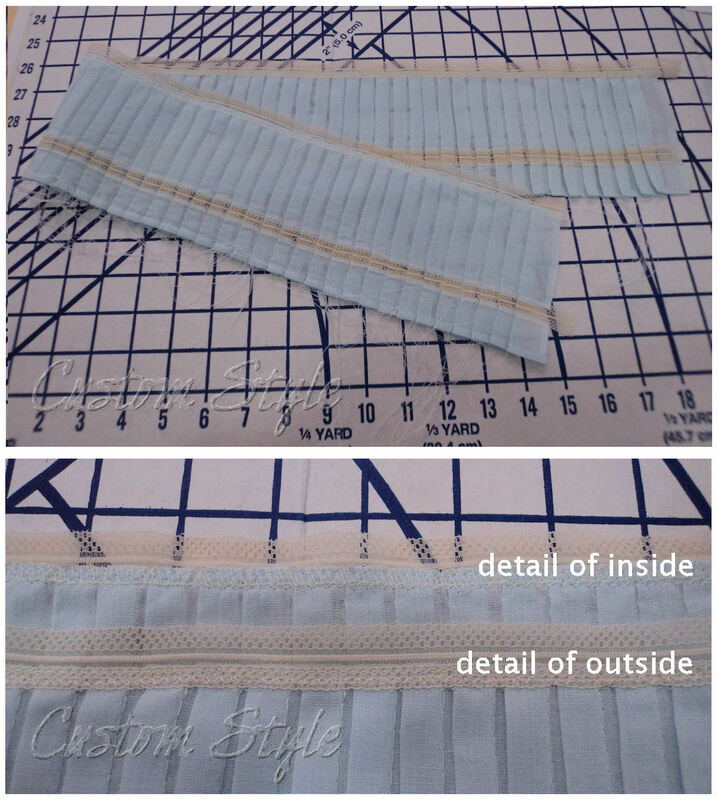 The original strip of lace and how I cut it apart to get what I needed. I used rows 2, 3, & 5 in the picture on right. 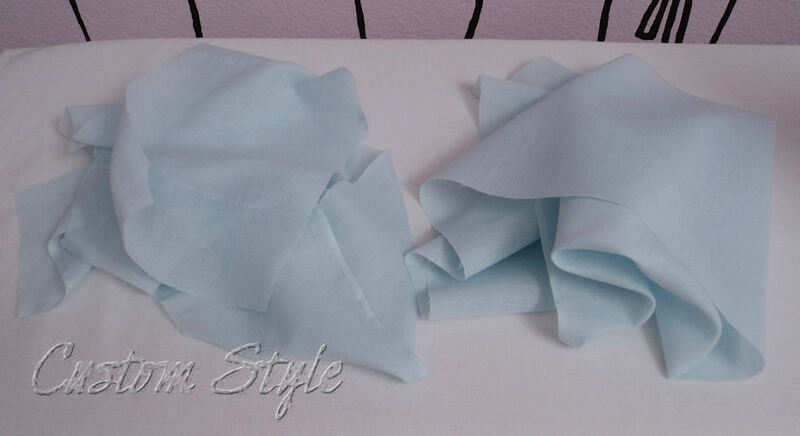 In my fabric stash, I found the perfect piece of pale sky-blue cotton voile. It is the thinnest semi-sheer fabric with a soft drape – I knew it would be perfect. 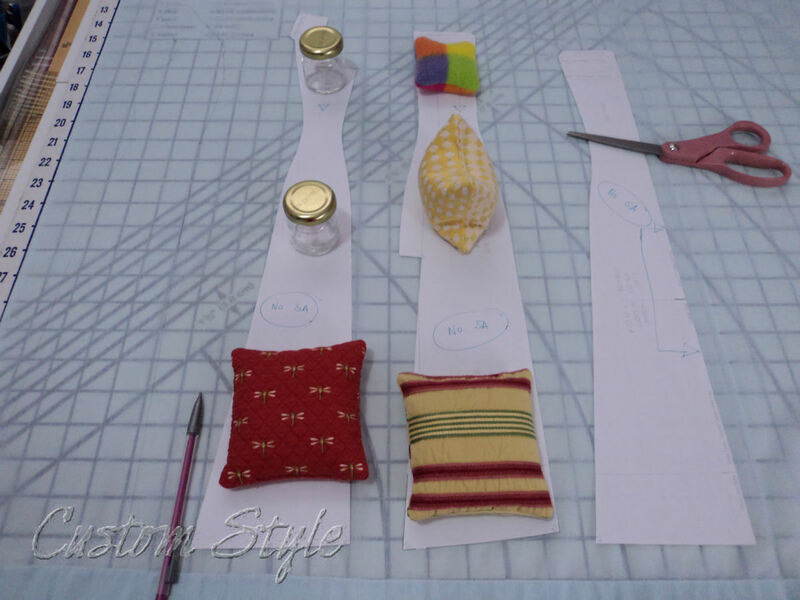 (When I can, I like to make my mock-ups in scrap fabric similar to the final garment fabric in hopes that the mock-up itself can be usable – every so often I get lucky, like I did when making my Forties style dress.) I also had enough fabric if I needed to re-cut anything that needed major adjustments. But the lace was bright white, and I hated it paired with the fabric. 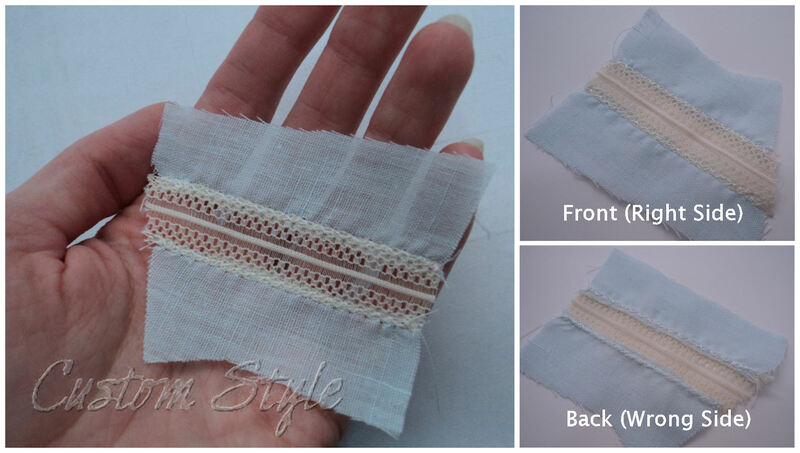 Thin cotton fabric with white lace & tea-dyed lace comparison. The first thing I did after printing my tiny pattern was cut off all the seam allowances so that I could truly test it. I pencil-traced the stitch-lines directly onto the fabric. 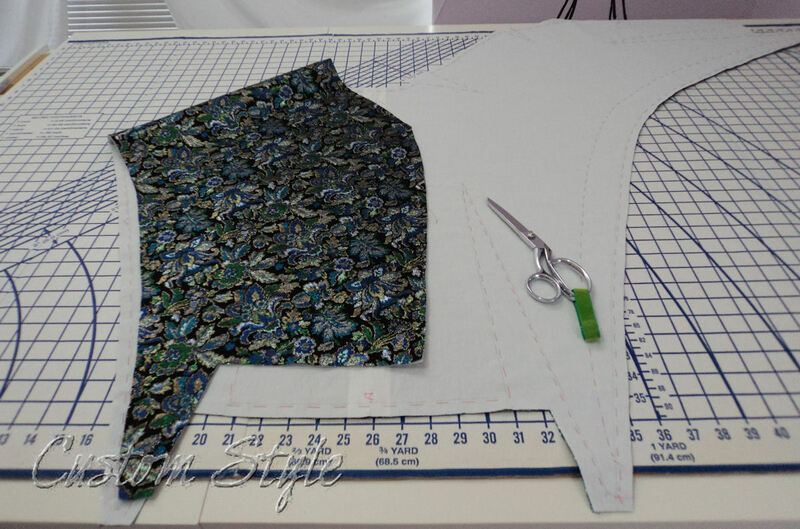 Next, I cut out my pieces, adding an unmeasured seam allowance around all the lines. Then I pinned directly through my lines (ignoring all the uneven seam allowances), matching points and the notch marks I made for myself, and stitched right on the line. There was only one major alteration needed for this pattern: the princess seams were majorly far apart. According to a standard measurement chart in one of my books, the bust point to bust point measurement for a 36-inch bust is 7½ inches, and the pattern was measuring at the equivalent of a 42½-inch bust. 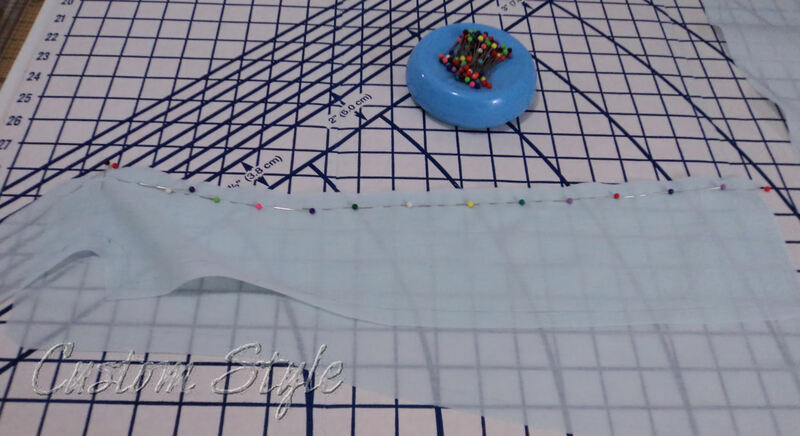 I just lined the seams up to the proper spot on my little dressform (like I would do for any garment I was fitting on the person I was making it for) and put a seam down the center front. I took out the equivalent of 2 inches from the pattern. Luckily, I knew a center front seam would disappear once I added the trim. 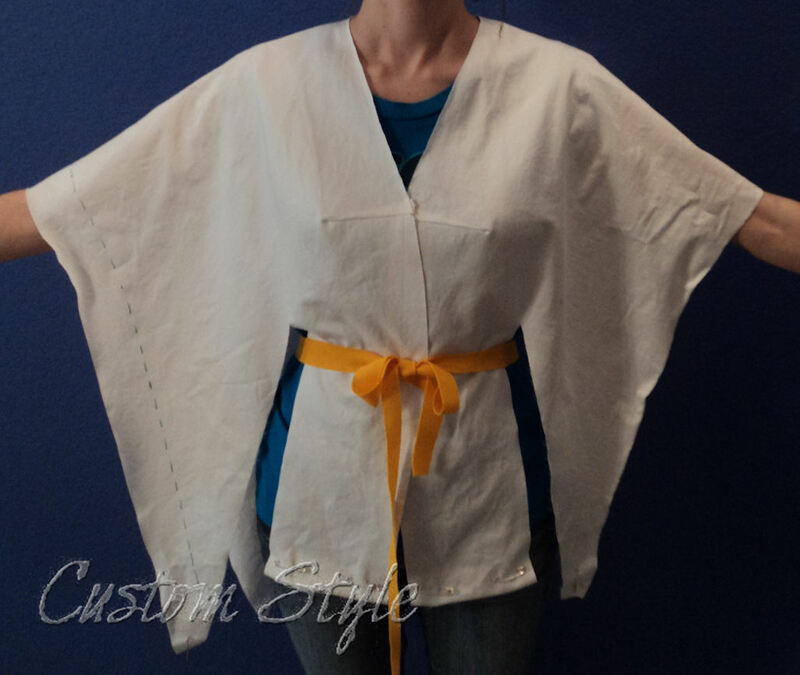 I made some minor tweaks to the rest of the pattern, but nothing out of the ordinary required for a custom fit. I did a lot of pin fitting to test the mock-up. When I was convinced that the pattern lines were good, I decided to trim out the mock-up and make a finished miniature model. 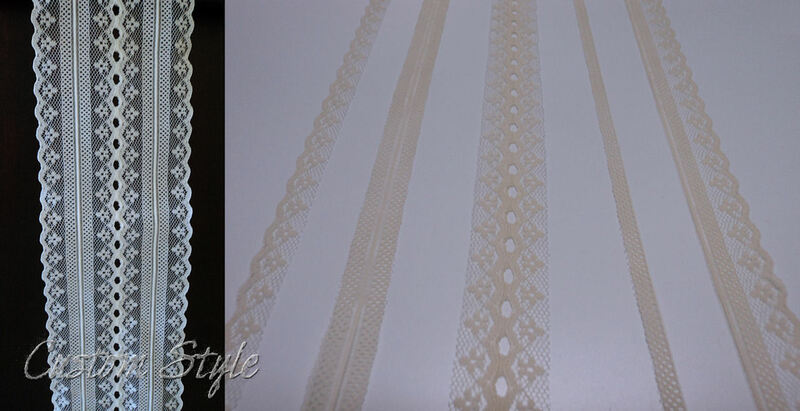 I tried a sample finish for the inset lace with my thin cotton voile fabric. 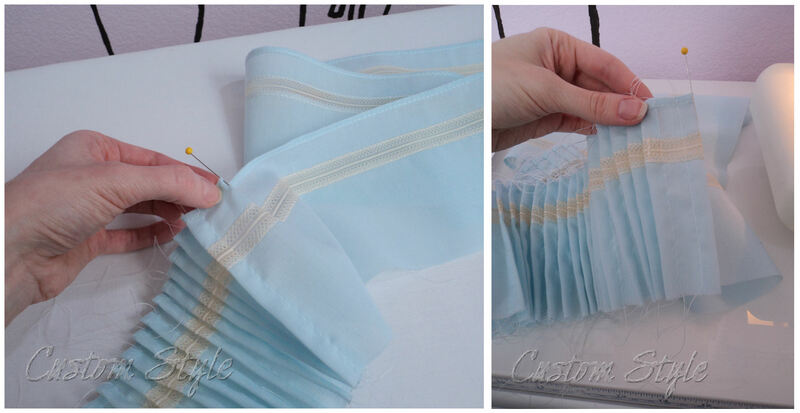 I straight-stitched the edges of the lace to the right side of the fabric, zig-zagged over the previous stitch, and trimmed the fabric under the lace trim close to the stitching. On a full-scale slip-dress, I would hand-sew a tiny rolled-hem instead of trimming next to the stitching, but my half-scale seam allowance was a bit small & awkward to roll (and besides, it isn’t going to get the wear-and-tear that a real dress would). I planned the order of my lace application and joined the shoulder seams so that I could trim the neckline all at once. When I was finished sewing all the insertion lace, my little dress was happily just as pretty on the inside. =) I enjoyed trying my hand at insertion lace. Then it was time for fun with pleats! I had the fortunate idea to use sizing on my fabric before I started pleating it – if only I had thought of using it sooner! (It would have really given the rest of the dress a more polished look.) I knew sizing would keep the drapey fabric from shifting too much when I was folding straight lines for pleats. I ironed the sizing into the fabric before cutting it for pleats. Sizing gives fabric a little bit of body but isn’t stiff like starch. 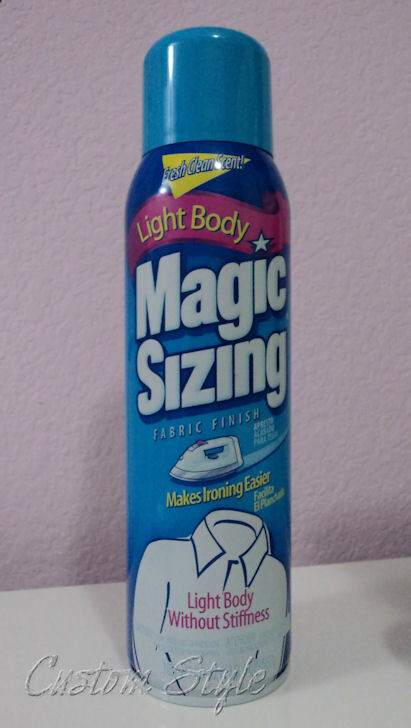 I can find it at any of my local grocery stores but you can also find sizing on amazon if you need to order some. Comparison of my fabric without (left) and with (right) sizing. I basted one pleat, then measured to the crest of the next one and basted the size of that pleat. I repeated until whole strip of fabric was pleated. 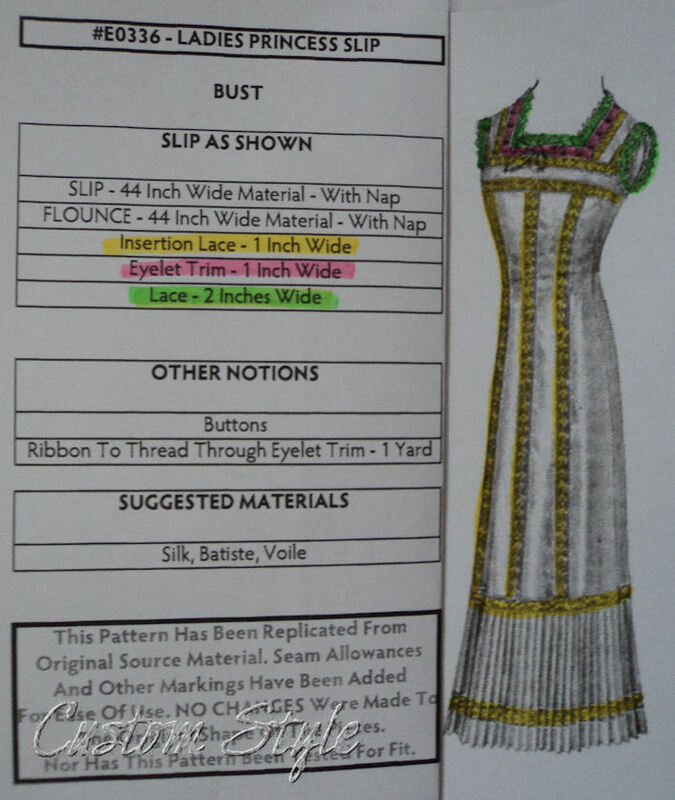 Row of basted pleats with lace edge that attaches to slip-dress. 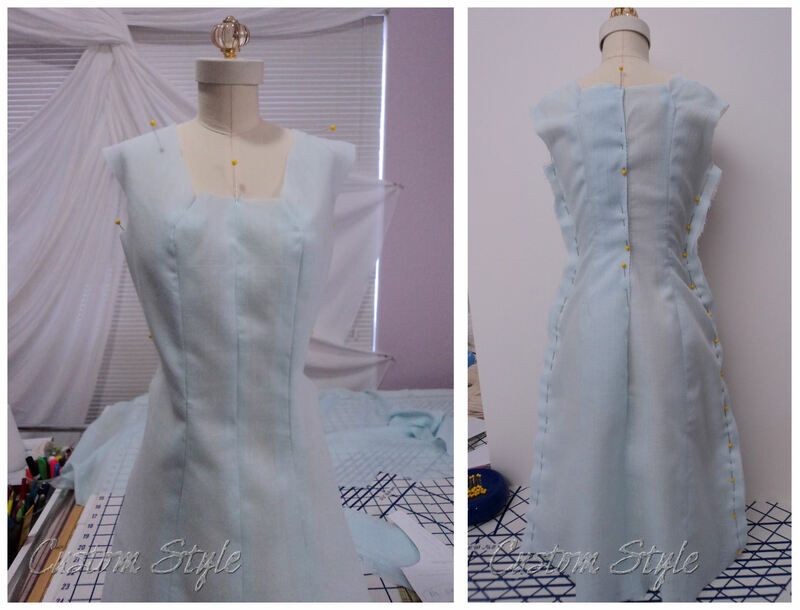 I test-pinned my pleats to the dress and adjusted for a level hem. 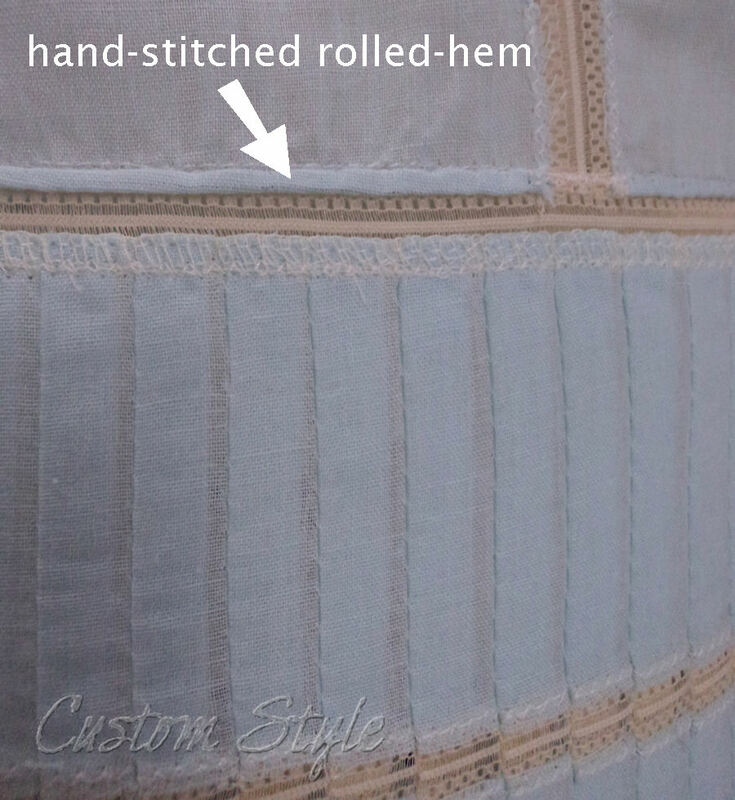 I had a bigger seam allowance because I attached the lace to the seams separately, so I was able to hand-stitch a rolled-hem like a true vintage slip-dress would be finished behind all the insertion lace. 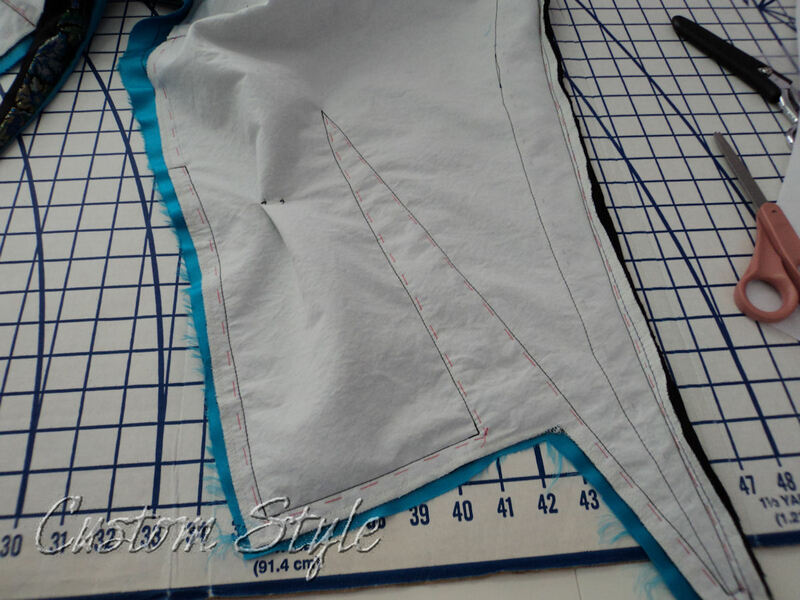 Inside of slip-dress where pleated flounce is joined. After the flounce of pleats was attached and a little ruffle of lace was hand-sewn around the neck & armholes, I had fun removing all the pleat basting. I haven’t yet decided on the details of the center back row of buttons. I have some small standard buttons but I may want shank buttons that close with loops. And now for the (nearly) finished dress! Aside from the pins down the center back, everything else is complete. Front detail with ribbon threaded through eyelet lace. Can’t you just imagine one of the Crawley girls of Downton Abbey wearing something like this? 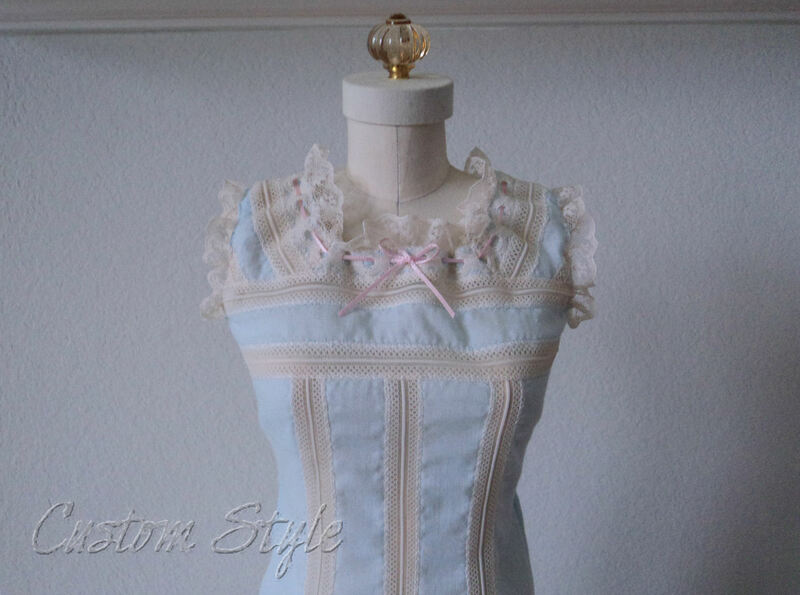 I think I may sew myself a camisole top by making an adaption of this pattern – without buttons all the way down the back. 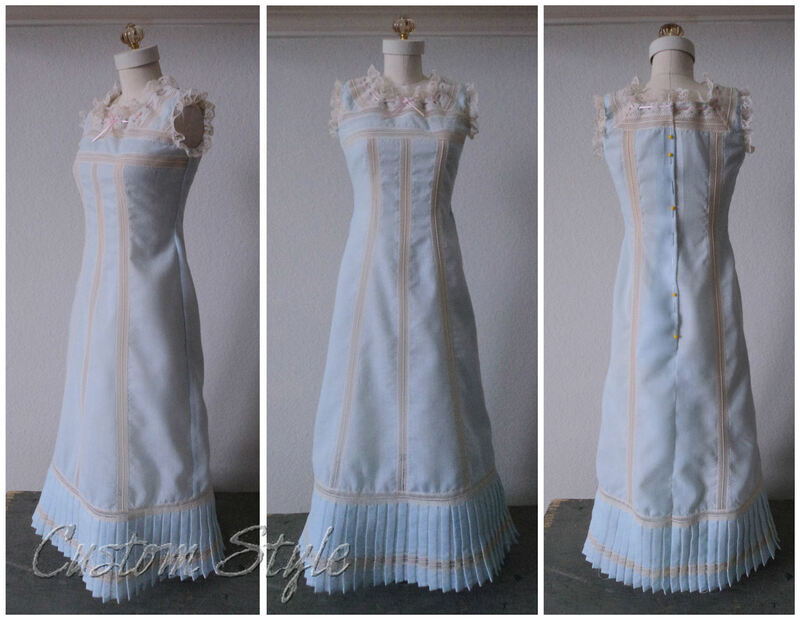 The pattern would make a sweet retro wedding dress with a plain under-slip for a lining. It would even be a fun modern dress with maybe appliqué trim instead of inset lace – I have some thin cotton shirting in a bright floral print that that would be perfect for summer. 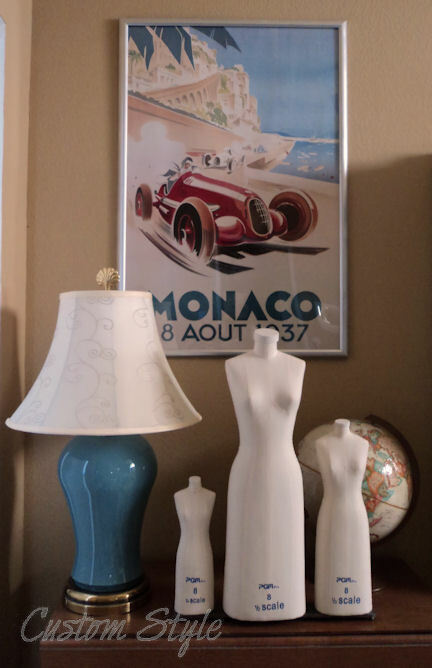 Oh, the ideas inspired by a vintage pattern from the Titanic era! My in-laws surprised me with a wonderful Christmas present that will add to my arsenal of sewing tools: a set of 3 miniature dressforms that were on my wish list! I thought I would eventually buy them for myself when I had the extra money, but now I don’t have to! The set includes three to-scale forms: a half-scale, a third-scale, & a quarter-scale. Being 3 different scales, I didn’t want to name them as if they were triplets – they are more like sisters of various ages. So I tried to think of any movie or classic literature that was about 3 sisters. It seemed like everything I was remembering was about 2, 4 or 5 sisters. But then after a couple of days of tossing some ideas around in the back of my mind, it just came to me: My new dressforms are Mary, Edith, and Sybil – the Crawley sisters from the British series “Downton Abbey”! They are the perfect names for my little dressforms because I’ve been eagerly awaiting Season 2 of “Downton Abbey”, which starts airing here in the States this coming Sunday. It is a period drama that begins in 1912 with the news of the RMS Titanic’s sinking, and Season 2 picks up with Britain entering World War I. 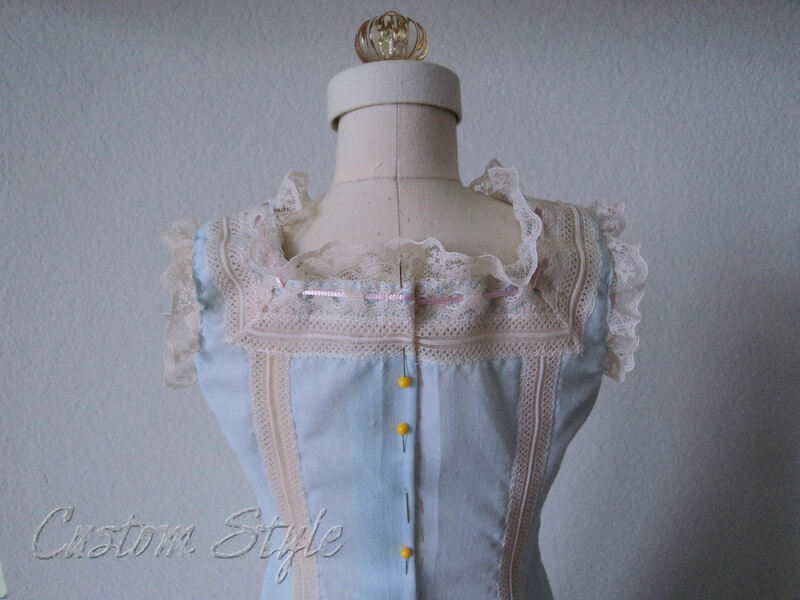 It is also very fitting because I have been planning to make some dresses from the 1910’s time period, and I’ll be able to use my new little dressforms for draping them. The project is a group effort to recreate & test all the clothing patterns (men’s, women’s & children’s) from a French magazine published in 1912 in order to digitize & preserve a piece of sewing & fashion history. The only requirements to join the undertaking are the ability to sew a mock-up of whatever pattern you are sent each month (which have little to no assembly instructions), and the promise of at least one blog entry (including some photos) about your experiences with the patterns every month. Seemed simple enough. So I’m going to join the effort and make few mock-ups and document my accomplishments here on my blog. Another goal (and probably the biggest one I have) is to get my Etsy shop up and running. I know a few of you readers have been asking about it, and I’m still working on all the details and building some items for inventory. I plan to offer a variety of things from dresses to accessories to collectibles. I promise to write a blog post all about the “Grand Opening” of my shop – so bookmark or subscribe to my blog (button above in the right-hand column of this page) to make sure you don’t miss it. Besides a couple of other small goals, I also plan to redo my banner & avatar, which requires me to find some time to sew something for myself. Ever heard it said that the cobbler’s kids have no shoes? Yeah, well, same goes for the seamstress – always sewing for everyone but herself. 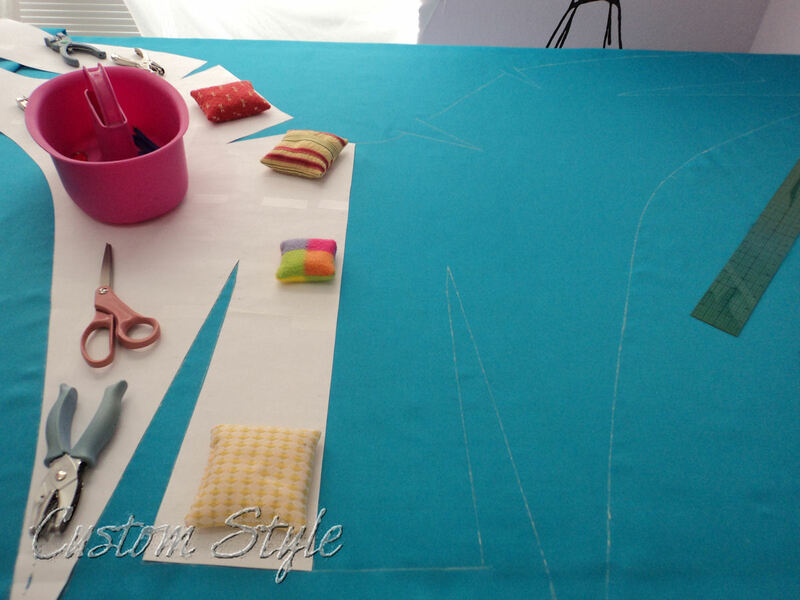 I have a retro dress design and the fabric all ready to go… I just need to start. Here’s hoping for motivation and persistence in 2012!